Manute Bol was one of the tallest, fun to watch players in NBA history. The former NBA specialist was known for his fearsome ability to block the ball and occasionally hit three points despite his ridiculous length. Bol passed away in 2010, but his basketball legacy is being continued through his son Bol Bol. 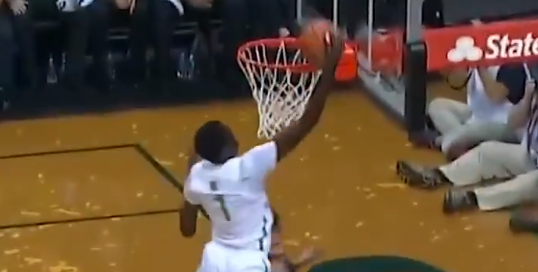 The 7’2″ Bol made his NCAA exhibition game debut for the Oregon Ducks. Despite being incredibly raw on the defensive end, Bol showcased an impressive offensive game, hitting a ridiculous turnaround three, a nice stepback jumper and a thunderous dunk. Bol finished with 19 points, eight rebounds and two blocks in 34 minutes for Oregon. The 18-year-old isn’t going to be dominant from the getgo, but his ability to do so many different things despite his height and age is going to make him incredibly special to watch. Bol Bol has a good shot to be just as good of a pro, if not better than his pops.